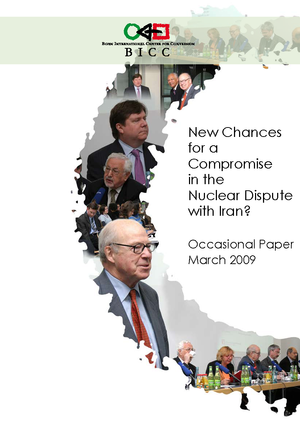 BICC Publications/New Chances for a Compromise in the Nuclear Dispute with Iran? You are here: Home » Publications » New Chances for a Compromise in the Nuclear Dispute with Iran? New Chances for a Compromise in the Nuclear Dispute with Iran? On 4 December 2008, the Bonn International Center for Conversion (BICC) and Deutsche Welle jointly organized a half-day conference on the nuclear dispute with Iran in Bonn, entitled “After the Elections in the United States: New Chances for a Compromise in the Nuclear Dispute with Iran?” With the forthcoming presidential elections in Iran in mind, one of the aims was to explore the interdependency of international politics and the internal development of Iran. With this publication the main findings of this well attended conference are made available to the public. Our distinguished panelists were Prof. Dr. Hans Blix, former Director General of the International Atomic Energy Agency (IAEA); Dr. Ebrahim Yazdi, Secretary-General of the opposition party Freedom Movement of Iran; Dr. James Walsh, Research Associate at the Massachusetts Institute of Technology; PD Dr. Bernd W. Kubbig, Senior Research Fellow at the Peace Research Institute Frankfurt and Jerry Sommer, Research Associate of BICC.